On the same day as the death of Neil Armstrong, the first astronaut to step onto the Moon, became public, the NZ High Court moonwalked its way to an off-the-world moment. It decided that greenhouse gas emissions and global warming are off-limits in the planning for an open cast coal mine. That’s as just as ‘out of this world’ as denying that the Moon landings ever happened, argues Simon Johnson. On Saturday, two bits of news struck home to me very strongly. The first was the death of moon-landing astronaut Neil Armstrong. The second was the High Court decision that open-cast coal mines and global warming are legally and jurisdictionally unrelated in the Resource Management Act. The moon landing in 1969 I remember very well. As a seven year old, I listened attentively to the ‘one small step’ broadcast. The whole class was silent under the spell of our teacher’s scratchy transistor radio. It’s one of my most strongly held memories of those days. I guess that reflects quite well on that class of seven year olds. They stopped playing bullrush, sniffing with colds, and fighting over lunches to listen attentively to the unfolding of one of humanity’s most historic moments. While I was still fondly remembering the Moon landing, the next news item struck. It was the High Court decision barring discussion of carbon dioxide emissions when coal mines seek Resource Management Act consents (see Radio NZ, NBR and TV3 and the Otago Daily Times). Of course this is about the Perth coal company Bathurst Resources and their Escarpment Mine Project. Bryan has posted that this project represents New Zealand doing a Pontius Pilate and washing its hands of the emissions. I posted that the decisions by councils and the Environment Court to date reflect the zombie ETS infecting the Resource Management Act with climate madness. Open-cast coal mines and global warming are unrelated! Thats about as sensible as saying the Moon landings were faked by NASA. Neil Armstrong would just have smacked someone in the face! From small half-asleep reactions, blog posts do grow. With the wee footnote that it was actually Buzz Aldrin who punched the Moon landing denier. I could do a review of the legal issues, but that would be just more legal-climate yadda yadda. I will just note that back in the early 1990s, the Bolger National Government considered the Resource Management Act to be one of the main tools to deal with global warming. 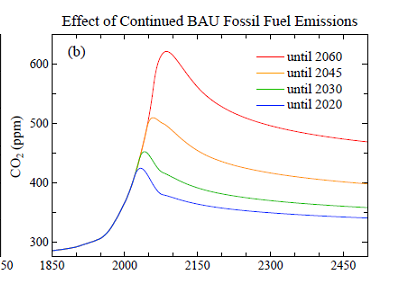 As for the science of it, I will point to a couple James Hansen charts from his The Case for Young People paper. The first is cumulative emissions of carbon dioxide. Approving new coal mines adds to cumulative global emissions of carbon dioxide. 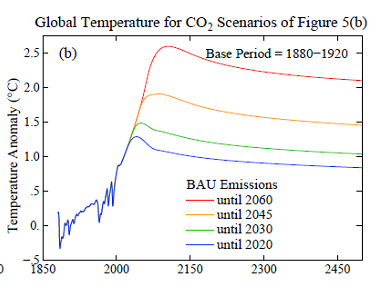 The second chart shows likely scenarios for temperature. The more carbon dioxide accumulates, the higher the likely temperature. The facts are that each time a new coal mine is approved, we are just adding to the temperature overshoot above two degrees. Why is it that the High Court can’t apply this simple logic? Why are we even in a position where the High Court can sever the undeniable link between new coal mines, the volumes of carbon dioxide accumulating globally, and the inevitable temperature rise? What has has happened to our legal and planning systems to make this sort of decision possible? To me this outcome — where the global effects of more GHG emissions are legally severed from approval of a new coal mine — is just as ‘out of this world’ as denying that the Moon landings ever happened.